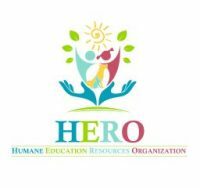 HERO was founded to improve the world, one child at a time, through humane education. Education empowers us to make informed decisions, breaks down superfluous barriers, and unlocks opportunities. The solution to many societal dilemmas are discovered through education. Humane education focuses on social and emotional learning and instills humane action. Humane action may be as easy as a kind word or a helping hand; or as involved as writing letters and making toys for shelter pets. It is never too early, nor is it too late to teach these values. Children of all ages can benefit. When we teach compassion and act with kindness, we improve the lives of others, which, by its very nature, improves our own lives. Currently, thirteen States have laws pertaining to teaching humane education. In California the law states, “Each teacher shall endeavor to impress upon the minds of the pupils … the meaning of equality and human dignity, including the promotion of harmonious relations, kindness toward domestic pets and the humane treatment of living creatures.” However, educators are busy teaching the required curriculum of the traditional subjects without any time to spare. One teacher informed us that she would not have time in her day to show a humane education video. We will change that! There is a growing movement of humane educators and research is being conducted to prove the benefits. HERO is proud to partner with these groups and carry out our mission to empower children to make educated decisions that have a positive impact for all. We will convince parents, teachers, superintendents, and school councils of the importance of humane education so that it becomes part of the curriculum. Humane education encourages curiosity and life-long learning, as our world is ever changing, the best solution today, may not be the same ten years from now. HERO will evolve and grow with the changing world and continue to make these tools accessible to all.